looked at the man and said 'You have a Vivant employee badge on.' He told me that Vivant bought out Monitronics. I said, 'No they didn't, I would've received an email.' I told him no thanks and goodbye. He then left without saying another word. A few minutes later, I remembered that I did receive an email from Monitronics, quite a few months ago, warning of this happening…. Beware and be alert!" * … MOVE: I spent the last week moving into a new home, and I could not have done it without some superior customer service from a few local companies. Jesus and Ryan of Hansen's Moving and Storage were quietly efficient and friendly, and Rich Johnson of Johnson's Painting squeezed me into his schedule to spruce the place up. Also kudos to local Realtors Dutch Toews and Gary Gibson who made the process seamless. These are times when you welcome those local connections in a town like Bakersfield. * … BELMONT: This is the week of the Belmont Stakes when California Chrome will be going for the coveted Triple Crown. 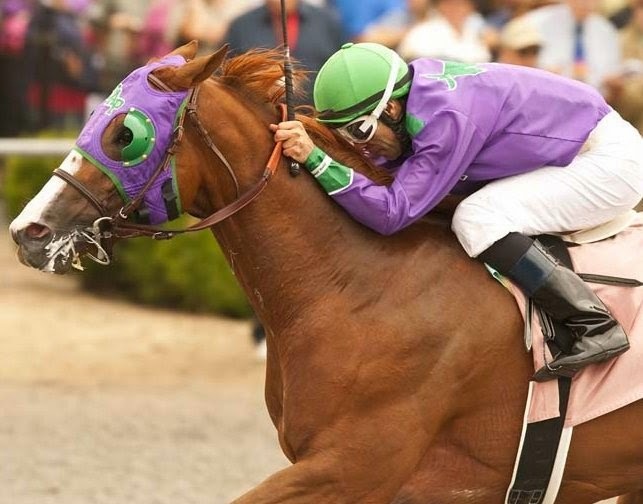 The California-bred colt is the darling of the nation, and all eyes will be on the New York race park when he races at 3:30 p.m. PST on Saturday. Steven Mayer, the Californian's senior writer, will be at the Belmont covering the story. * … SPOTTED: I spotted this bit of humor on Twitter: "Twitter is like the fridge. If you're bored, you keep opening it." someone named Richard Lemucchi, a real gentleman." Reynier said he was not sure if it was the same man, but he recalled working for Richard Lemucchi and his family during his junior and senior years in high school at the Tejon Theater. "I remember Richard not only as one of the finest athletics to come out of Bakersfield but also as one of the classicist dressers in town at the time and all the girls that worked for him, fell in love with him. He had a big problem at the time with pigeons. They would roost and break the neon lighting. The city would not let you spray a chemical that would burn their little feet and then they would fly away to roost somewhere else. So Richard and I on some nights, during the last show, would go up on the roof and shoot them. We would drop them into a dumpster in the alley from the roof. I think that he may have helped me attain expert marksman when I entered the Army." * … LEMUCCHI: And speaking of the Lemucchis, Tim Lemucchi wrote to say he is among the proud alumni of St. Joseph's School. "All the Catholic kids who lived in East Bakersfield went there. We assembled by class in line each morning in the yard in front of school. Sister Mary Imelda, the principal, would lead the flag salute and morning prayer and then we would march to our classrooms. If you were an unruly student, which I was occasionally, the sisters of Mercy who ran the school would provide little mercy. A good rap across the knuckles with a ruler would usually end problems immediately. Mrs. Wonderly, my fourth grade geography teacher instilled in me a love and fascination for geography that I retain today." * … NUT FESTIVAL: An update on the upcoming Nut Festival set for this Saturday at the Kern County Museum from 9 a.m. to 6 p.m. One of the features will be folks sharing the Nuttiest Thing That Ever Happened to Me, a live story-telling event where people can tell a true, family-friendly story about something nutty that happened to them. Among those sharing stories will be Californian executive editor Bob Price, radio talk show hosts Scott Cox and Ralph Bailey and Californian heath reporter Courtenay Edlehart. Too bad this is scheduled right when California Chrome will be running in the Belmont Stakes.